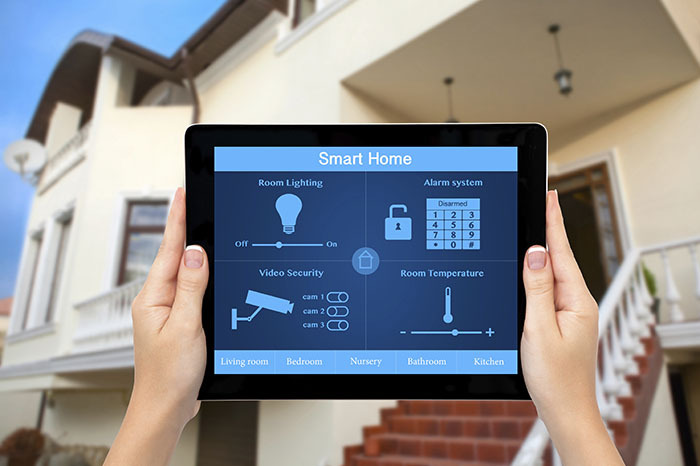 Home › Real Estate › Should You Seek A Smart Home? As you would probably assume from our previous blogs, we love to quote survey results here at First International Title. In fact, it’s our belief that surveys do provide a good perspective about trends – be those good or bad. It appears smart home appliances and technology is becoming more common and home buyers are increasingly choosing homes that carry the latest tech savvy features. Coldwell Banker Real Estate LLC surveyed more than 500 sales associates and uncovered what smart features home buyers most desire and how those features impact a home’s sale. Almost 64 percent of sales associates agreed that buyers today are more interested in homes with smart home features and technology than they were two to five years ago. Can you say progress? Further, 62 percent of respondents said they’re seeing more buyers interested in controlling their home technology through their smart phone or tablet. Apparently, highlighting smart home technology can really pay off in the long run. One in three sales associates noted that homes with smart home features and technology tend to sell faster than homes without them. As a point of reference, some of the smart home technologies listed included security, temperature control, safety (i.e. First Alert OneLink), lighting, entertainment and appliances. We say keep an eye on this movement as the prediction is that in three to seven years most homes will be completely outfitted with smart technology. You certainly don’t want to get left behind!